The Agenda for the 2018 Annual General Meeting to be held at the Horowhenua Pétanque club on Saturday, 16 June starting at 1:00 pm. The video of the 2017 Oceania Championship Women’s Triples final at Christchurch between New Zealand and Tahiti is on the Wellington Pétanque YouTube channel. 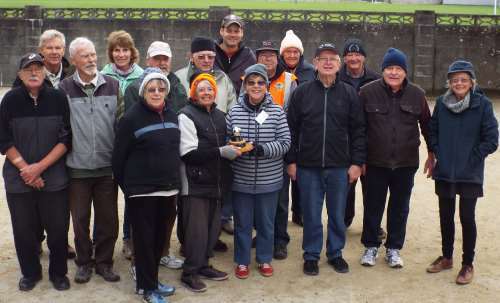 On Wednesday, 30 May 2018 the Upper Hutt Pétanque Club played our traditional challenge against the Masterton Club for the Boules To You trophy. Four teams from each club played four rounds of doubles. After the third round the score was six games each. In the last round, Upper Hutt managed to win three of the games and therefore won the trophy by nine games to seven. This proved very satisfying as Upper Hutt has not had their name on the trophy for quite a number of years. A good day was had by all. Otaki’s first defence of the Jacques Cochonnet Trophy was away at Horowhenua. They started slowly, winning just the Doubles game in the first round to trail 1-2. In the second round, Otaki won all three games to lead 4-2. In the final round, Horowhenua picked up the Singles and Triples, but fell just short as Otaki won the Doubles to claim the match 5-4. Otaki’s next defence is at home to Naenae. The Auckland and Wellington Development teams to contest the Chanticleer Cup have been announced. The match will take place at the Herne Bay Pétanque club, Auckland, on 25-26 August 2018. Paul Dalebroux (Stanley Bay), Grant Hackett (Herne Bay), Janet Hackett (Herne Bay), Andre Noel (Kennedy Park), David Peni (Panmure), Junior Puleitu (Vikings). Ian Baker (Herne Bay), Tony Irvine (Cockle Bay), Seti Mailei (Panmure), Jay Newton (Hibiscus Coast), Bill Peachy (Hibiscus Coast), Selwyn Sainty (Herne Bay). Trish Biddle-Amoroa (Wanganui East), Moises Burgos (Upper Hutt), Yvonne Futcher (Wanganui East), Vaughan Husband (Manawatu), Michelle Maxwell (Kapiti), Ron Sandilands (Manawatu). Brian Bradburn (Silverstream), Claire Bradburn (Silverstream), Tony Gatford (Kapiti), Ann Hogg (Otaki), Marc Khull (Manawatu), Lynne Shepherd (Kapiti). Reserve: Graeme Millard (Upper Hutt). Trish, Moises, Vaughan, Michelle and Lynne will be making their Wellington Representative debut. Some highlights from the Annual General Meeting held at Horowhenua. The minutes will be sent out in due course. The triennial Tournament review will be undertaken shortly. The next WPA Committee meeting will be held on Sunday, 15 July at Kapiti. 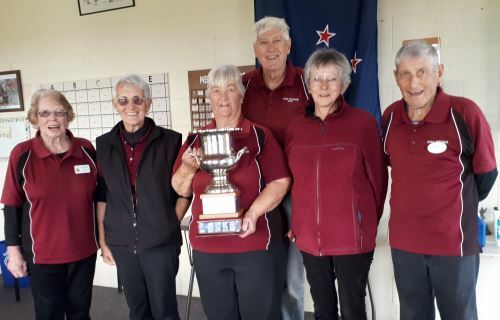 The Wanganui East Open Triples has been renamed the Pete Hamilton Memorial Triples. The Triples will be held 17-18 November 2018.